A luxurious interior doesn't come more AFFORDABLE than this. We offer you a range of design options, each giving you the ability to improve the look and thermal performance of your home extension. Loggia Prestige - Great value, great looks! Comprising of four distinct elements, a Loggia Prestige feels comfortable all year round. Loggia Prestige incorporates the super insulated Loggia narrow columns, Prestige insulating pelmet and Livinlight, which together address the three main heat loss areas, transforming a conservatory into a thermally efficient Loggia extension. This will keep the room cooler in the summer and warmer in the winter, reducing your heating. Externally the Loggia Prestige is beautiful, enhancing any home. The Loggia columns together with the Prestige Cornice create a wonderful look and feel, that enhance old and new properties alike. Loggia Premium - For a bespoke solution to adding light and space to your home, choose the Loggia Premium. The light, bright and airy interior will add a new dimension to your home and provide a seamless link between your home and garden. With the Loggia Premium you have at your disposal an exceptional range of design options, each giving you the ability to stamp your own personality on every aspect. Design options include multiple wide or narrow super insulated columns sitting on or off plinths, topped with the Classic Cornice outside, internally insulated with a perimeter ceiling and warmed by radiant panel heaters. Loggia Ultimate - Perfect for those seeking an extension in total harmony with their home. The vaulted ceiling gives your living space an even more spacious feel that you will use all year round. The Loggia Ultimate fuses all of the elements of a Loggia Premium with the ultimate roofing - realROOF by Ultraframe. LivinROOF - Thinking of something other than a glass roof? LivinROOF is the first roofing system designed to give you the flexibility to choose a solid roof or combine solid and glazed roofing seamlessly. It helps you extend your living space and enhance thermal performance to give you a room that you can use all year round. All LivinROOF designs come complete with with LivinROOM perimeter ceiling system as standard, not only providing the perfect place for spotlights and speakers, but it gives the effect of lifting the vaulted ceiling, giving a light airy feel to the new room. LivinROOF can incorporate the Classic Cornice - hiding the guttering and giving your conservatory a modern, aesthetically pleasing feature. Externally the LivinROOF is finished in urban grey to complement virtually an house style and give a contemporary look. The LivinROOF is quick to install compared to other solid roofs on the market and because of its pre-fabricated design, doesn't require any on site cutting, reducing waste and disruption. realROOF - Offers a magnificent vaulted plastered ceiling on the inside enhancing the feeling of space. It can be 'dressed' on the outside with tiles or slates to exactly match those of your home. Whether it's for a living room, dining room, kitchen, bedroom or bathroom the UltraSky rooflight will be the perfect stylish solution for you to flood light into your home, enhancing any style of property. The UltraSky rooflight is available in a number of bespoke rectangular sizes ranging from 1m x 1.5m to 2m x 4m. Choose the stylish white uPVC option to match your modern window frames, or for that extra 'Wow' factor go for the aluminium option in white, anthracite grey or satin black. Internally the roof-light is clad in white uPVC or upgraded to anthracite grey or satin black to match or contrast the external finish. 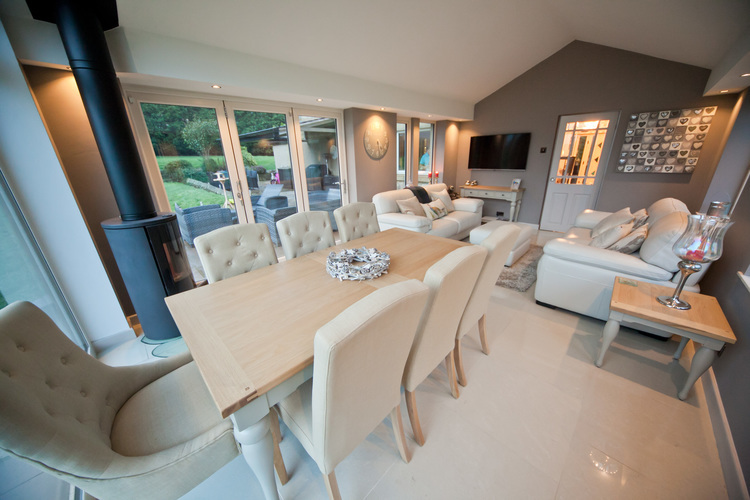 Ultraframe's unique software - with its integrated design guide - draws on weather data to ensure your conservatory/extension is designed for that once in 50 year occurrence of extreme snow loads or wind speeds. And we'll use your postcode to ensure compliance with the correct structural loads. High performance glass - If you're specifically wanting to bring a lot more light into your home, then a glass roof is the right choice for you. 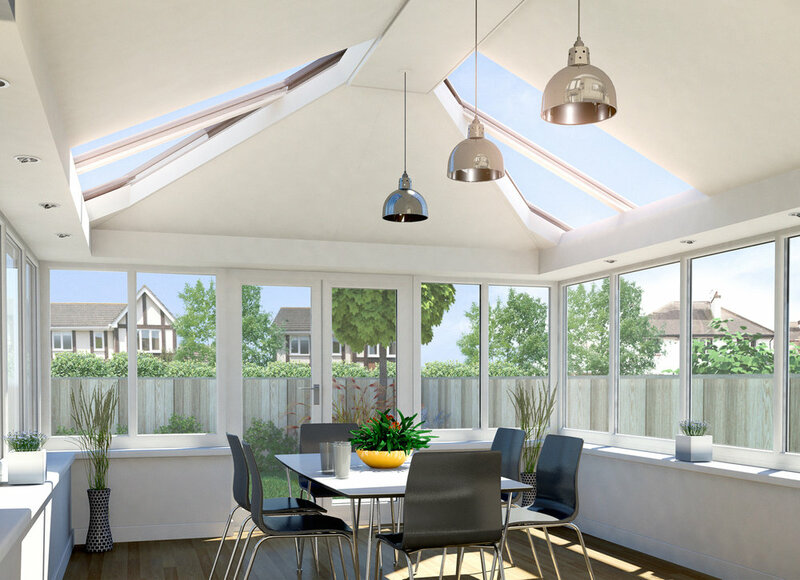 High performance roof glass works by deflecting heat from the sun in summer to keep the inside of the conservatory cooler and by retaining the warmth from heating appliances in winter. It also features a true self clean coating that uses the power of the sun to break down organic deposits and then uses rain water to wash it clean away. Polycarbonate - Polycarbonate roof glazing is a lower cost alternative to glass but still provides excellent thermal properties and aesthetics. Polycarbonate is available in a range of colours, thickness and specifications: Clear, Bronze, Solar control, Opal, Bronze/opal. Colour options - The foil laminated products used on major items in the roof and on the uPVC side frames, have a real wood-grain texture to add a further dose of character. The products can be coloured one side or both, with the possibility to mix colours between the outside and the inside. Our standard foiled colours include: Grey, Ebony Black, Irish Oak, White, Cream, Sage Green and Fir Green.